The pre-party for the Berlin Pearl Jam concert 2018. 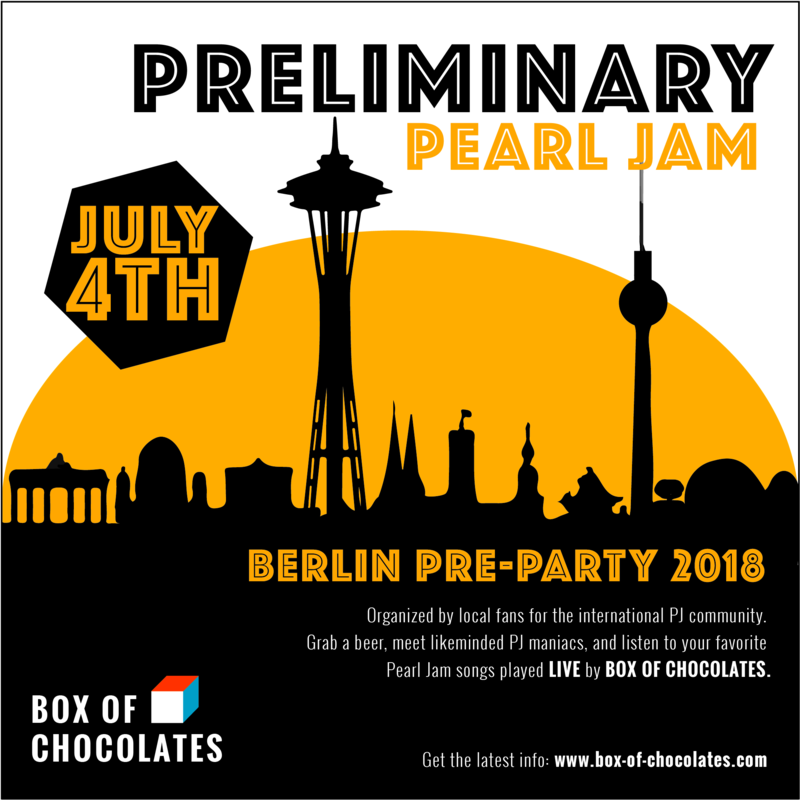 Box of Chocolates presents: PRELIMINARY PEARL JAM. The pre-party for the Berlin Pearl Jam concert in July 2018. PRELIMINARY PEARL JAM provides an opportunity for international PJ fans to connect with other fans, grab a beer and listen/dance/sing to some Pearl Jam played live. The pre-party will take place on July 4th, 2018, the night before the concert. We will play a mix of Pearl Jam cover songs and some of our own PJ-inspired songs. We rented the Baumhausbar („Treehouse bar“) Berlin! This is a cool and cozy spot right in the middle of Kreuzberg, located at the top of the club Musik&Frieden, the former famous Magnet Club. Doors open at 7 PM. Concert starts at 8PM. Cover charge: 5 Euro but free admission for all Pearl Jam fans wearing a Pearl Jam t-shirt! All PJ fans are welcome!